Become more aware of time spent on the computer. Is there a better alternative to Awareness? Is Awareness really the best app in Health and Fitness category? Will Awareness work good on macOS 10.13.4? 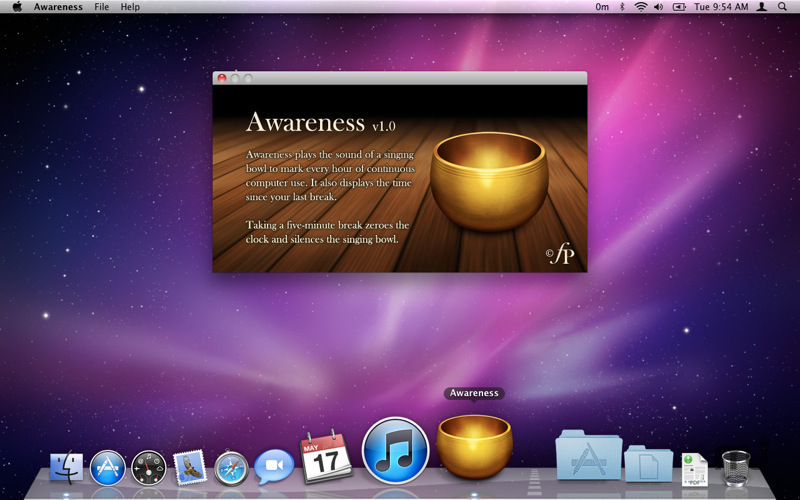 Awareness helps you become more aware of time spent on the computer by playing the sound of a singing bowl to mark every hour of continuous computer use. It also displays how long you've been using your computer without a break in the menu bar. Awareness will never nag you or force you to stop using the computer. Just take a five-minute break whenever you are ready, and Awareness will sense it. Fixes a crash when status menu item is hidden. Adds preferences for configuring busy time, break length, bowl volume, starting Awareness at login and more. Awareness needs a review. Be the first to review this app and get the discussion started! Awareness needs a rating. Be the first to rate this app and get the discussion started!